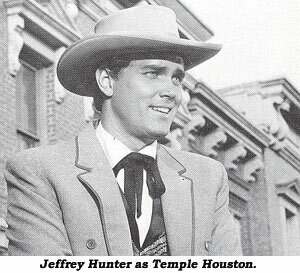 Do You Remember... "Temple Houston"
Warner Bros.’ “Temple Houston”, which ran from September 19, 1963 to April 2, 1964, began as a TV pilot produced by star Jeffrey Hunter’s own Apollo Productions. 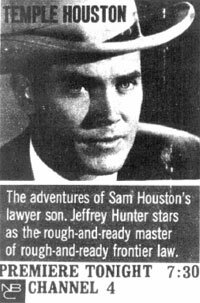 Midway through the TV series run, this pilot was released (Jan. ‘64) as a 57m feature film, “Man From Galveston”, with new dialogue changing the lead character’s name to Timothy Higgins. James Coburn plays second lead as the Marshal. Jack Elam told his friend Marty Kelly he was under contract to WB and had been in New Mexico for 4-5 days ready to shoot “A Distant Trumpet” when he was notified he was being cast in “Temple Houston” at “a hell of a raise from what I’d made on ‘The Dakotas’ (where Jack was the slightly higher paid of the four leads). I didn’t know anything at all about the James Coburn situation.” Claude Akins replaced Elam on “Trumpet” and the chaotic production of “Temple Houston” began Aug. 7 with the first show airing Sept. 19. According to researcher Glenn Mosley, “The Third Bullet” (directed by Alvin Ganzer) was shot in two days. “Ten Rounds For Baby” (directed by Conrad) was shot in three days including pick up shots and dialogue looping. Jack Elam remembers the series as having “good stories.” No wonder—many scripts came from excellent veterans such as Warren Douglas, Jack Turley, Ron Bishop and Paul Savage. Bill Conrad directed six, Bob Totten (upon Elam’s recommendation) helmed four, veterans Leslie H. Martinson, Irving Moore and John Florea completed others. If ever there was a television western which clearly defined the term “nearly forgotten”, surely it was the ‘63-‘64 NBC western, “Temple Houston”. This TV western focused on a real-life character, a circuit court frontier lawyer, the son of Sam Houston. 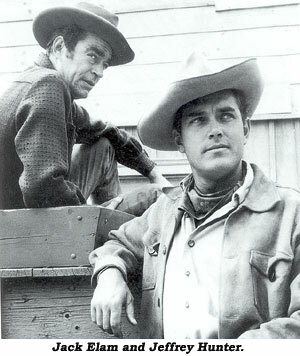 Film actor Jeffrey Hunter played the lead role and even produced the pilot film through his own production company for Warner Bros.
“Temple Houston” was originally targeted for the ‘64-‘65 season, but NBC abruptly changed its mind and rushed the program into production for the ‘63-‘64 season. Hunter, although signed, had to bow out of John Ford’s final western, “Cheyenne Autumn”, due to scheduling conflicts. Jeff’s pay scale for the lead role was typical of the day, $5,000 per show. His contract with WB also guaranteed him a starring role in a feature each year “TH” was on the air. “Brainstorm” is the one that was made. “TH” premiered Sept. 19, ‘63, and struggled in the Thursday night ratings right from the start, up against the likes of “The Flintstones” and “Rawhide”. In all, 26 episodes were produced. Scripts were contributed by solid television writers, with offbeat stories concerning Houston’s defenses of a woman prizefighter and a circus elephant. In “Sam’s Son” (by Warren Douglas) he defends old friends of his father, Sam Houston.